For other people with the same name, see Bill Jones (disambiguation). Bill T. Jones (born February 15, 1952) is an American artistic director, choreographer and dancer. Jones has received numerous awards for his work and is the co-founder of the Bill T. Jones/Arnie Zane Dance Company. Jones was born in Bunnell, Florida, and his family moved North as part of the Great Migration. They settled in Wayland, New York, where Jones attended Wayland Central School. He began his dance training at Binghamton University, where he studied classical ballet and modern dance. 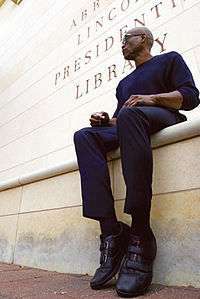 Jones choreographed and performed worldwide as a soloist and duet company with his late partner, Arnie Zane, before forming the Bill T. Jones/Arnie Zane Dance Company in 1982. Creating more than 100 works for his own company, Jones has also choreographed for Alvin Ailey American Dance Theater, AXIS Dance Company, Boston Ballet, Lyon Opera Ballet, Berlin Opera Ballet and Diversions Dance Company, among others. In 1995, Jones directed and performed in a collaborative work with Toni Morrison and Max Roach, Degga, at Alice Tully Hall, commissioned by Lincoln Center’s "Serious Fun" Festival. His collaboration with Jessye Norman, How! Do! We! Do!, premiered at New York’s City Center in 1999. In 1990, Jones choreographed Sir Michael Tippett’s New Year under the direction of Sir Peter Hall for the Houston Grand Opera and the Glyndebourne Opera Festival. He conceived, co-directed and choreographed Mother of Three Sons, which was performed at the Munich Biennale, New York City Opera, and the Houston Grand Opera. He also directed Lost in the Stars for the Boston Lyric Opera. Jones’ theater involvement includes co-directing Perfect Courage with his sister and prolific performance artist, Rhodessa Jones for Festival 2000, in 1990. In 1994, he directed Derek Walcott’s Dream on Monkey Mountain for The Guthrie Theater in Minneapolis, MN. Jones also collaborated with artist Keith Haring in 1982 to create a series of both performance and visual arts together. Television credits include PBS’s “Great Performances” Series (Fever Swamp and Last Supper at Uncle Tom’s Cabin/The Promised Land) and “Alive from Off Center” (Untitled). Still/Here was co-directed for television by Bill T. Jones and Gretchen Bender. A PBS documentary on the making of Still/Here, by Bill Moyers and David Grubin, Bill T. Jones: Still/Here with Bill Moyers, premiered in 1997. The 1999 Blackside documentary I’ll Make Me a World: A Century of African-American Arts, profiled Jones’ work. D-Man in the Waters is included in Free to Dance, a 2001 Emmy-winning documentary that chronicles modern dance’s African-American roots. Narrated by Jones himself, the BBC/VIEW also produced a documentary film, entitled Bill T. Jones: Dancing to the Promised Land, that documents the creation of Jones’s Last Supper at Uncle Tom’s Cabin/The Promised Land and guides us through the life, work, and creative process of Jones and the Bill T. Jones / Arnie Zane Dance Company. Bill's piece Still/Here explores and contemplates survival, life and art through dance and music. Still/Here is a two-act, evening-length dance-theater piece (premiered 1994) with a visual score made from edited interviews with people who were or are facing life-threatening illnesses. Jones is the co-creator, director and choreographer of the musical Fela!, which ran Off-Broadway in 2008 and opened on Broadway in previews in October 2009. Jones won the Lucille Lortel Award as Outstanding Choreographer for his work as well as the Tony Award for Best Choreography. In 1994, Jones received a MacArthur “Genius” Award. In 1979, Jones was granted the Creative Artists Public Service Award in Choreography, and in 1980, 1981 and 1982, he was the recipient of Choreographic Fellowships from the National Endowment for the Arts. He has been awarded several New York Dance and Performance (“Bessie Awards”); 1986 Joyce Theater Season (along with Arnie Zane), D-Man in the Waters (1989 and 2001), The Table Project (2001) and The Breathing Show (2001). Jones, along with his collaborators, sister Rhodessa Jones and Idris Ackamoor, received an “Izzie Award” in Choreography for Perfect Courage in 1992. In 2001, he received another “Izzie” for his work, Fantasy in C-Major, with AXIS Dance Company. He was honored with the Dorothy B. Chandler Performing Arts Award for his innovative contributions to performing arts in 1991. In 1993, he was presented with the Dance Magazine Award. In 2000, The Dance Heritage Coalition named Jones “An Irreplaceable Dance Treasure.” Jones has received honorary doctorates from the Art Institute of Chicago, Bard College, Columbia College, the Juilliard School, Swarthmore College, and Yale University. He is also a recipient of the SUNY Binghamton Distinguished Alumni Award. In 2003 Jones was awarded The Dorothy and Lillian Gish Prize, one of the richest prizes in the arts, given annually to “a man or woman who has made an outstanding contribution to the beauty of the world and to mankind’s enjoyment and understanding of life.” In 2005 he received the Wexner Prize at the Wexner Center for the Arts at The Ohio State University. In 2007, he won the Tony Award for Best Choreography for Spring Awakening. Jones was named a 2007 USA Eileen Harris Norton Fellow and awarded a $50,000 grant by United States Artists, a public charity that supports and promotes the work of American artists. Jones was inducted into the National Museum of Dance's Mr. & Mrs. Cornelius Vanderbilt Whitney Hall of Fame in 2007. In 2010, Jones won the Tony Award for Best Choreography for his work in Fela!. He was one of five recipients for the 2010 Kennedy Center Honors. Bill T. Jones was the recipient of the 2011 YoungArts Arison Award, which is given annually to an individual who has had a significant influence on the development of young American artists. He received a 2013 National Medal of Arts in July, 2014. Music: Wynne Bennett, Christopher William Antoino Lancaster and George Lewis, Jr.
Jones, Bill T.; Gillespie, Peggy (1995). Last Night on Earth (First ed.). New York: Pantheon. ISBN 0-679-43926-9. Jones, Bill T.; Zane, Arnie; Zimmer, Elizabeth; Quasha, Susan (1989). Body Against Body: The Dance and Other Collaborations of Bill T. Jones and Arnie Zane (First ed.). Barrytown, NY: Station Hill Press. ISBN 0-88268-064-1. Jones, Bill T.; Susan Kuklin (1998). Dance (First ed.). New York: Hyperion. ISBN 0-7868-2307-0. Zane, Arnie; Jones, Bill T.; Green, Jonathan (1999). Continuous Replay: The Photographs of Arnie Zane (First ed.). Cambridge: MIT Press. ↑ Julinda Lewis-Ferguson (2 February 2007). "Bill T. Jones". Queer Cultural Center. Retrieved 2008-08-17. 1 2 Bill T. Jones: Dancing to The Promised Land. VIEW Video. ↑ "MacArthur Fellows". The John D. and Catherine T. MacArthur Foundation. 2008. Retrieved 2008-08-17. ↑ The Dorothy and Lillian Gish Prize Archived October 6, 2013, at the Wayback Machine., official website. ↑ "Bill T. Jones honored with $50,000 Wexner Prize". The Advocate. Associated Press. 2006-04-16. Retrieved 2008-08-17. ↑ "Bill T. Jones: USA Eileen Harris Norton Fellow, Dance". United States Artists. 2007. Retrieved 2008-08-17. ↑ "Who's Nominated?". Tony Awards. IBM Corp. Retrieved 13 June 2010.